Where do carpenter ants get their name? What are their eating habits? Where do they set up nests? The important question regarding carpenter ants is: why do they invade homes? Some species of carpenter ants prefer the outdoors while other species are prone to infesting structures. If ants decide to nest outside, they will use places like hollow trees, rotten stumps, firewood piles, or soil beneath fallen timber. When they invade a house, normally they set up under or above insulation until they have the time to burrow into wood and make a nest. When they make a nest it is in or around normally water damaged wood or moist areas. How does a structure become target for invasion? A founding queen may start her colony in a building and the budding population may take several years to become a noticeable problem. The other primary means of structure occupation is when a mature colony takes up residence in a susceptible structure in a wooded area, which is usually adjacent to their existing nest. What is the appearance of carpenter ants? The appearance of carpenter ants varies. Some are small. Others are among the largest ants known. Workers tend to be 1/4″-3/4″ long. Winged ants, which are the reproductive males and females, are generally longer. 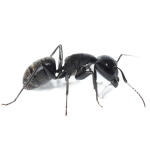 Why do you need to worry about carpenter ants? So, why should you worry about carpenter ants? You may only spot a few ants, but those ants come from a whole colony hard at work tunneling and creating nesting galleries just below the wood surfaces of your building. If the ants’ activity remains neglected, severe structural damage is a likely consequence. Early treatment will preclude having to pay expensive fees to restore the structural integrity of a building at a later date.